The only high-temperature HEPA filter that can comply with the most stringent FDA GMP* requirements. Incorporating a unique, floating component design, the Camfil Termikfil maintains integrity and rated performance values in applications where extremely high temperatures are a factor. Pre-qualified with an exclusive burn-in procedure, which significantly reduces system start-up time, the Termikfil outperforms other high-temperature filters. 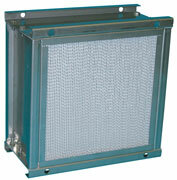 High-efficiency air filtration for applications with operating temperatures approaching 750°F. The Camfil F Series Absolute™ air filter is designed for special applications with operating temperatures of up to 750° F (400° C). Usually applied in special ovens for the pharmaceutical industry, the Camfil F Series Absolute may be applied in any situation where HEPA level efficiency is desired at unusually high temperatures. 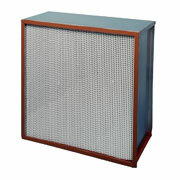 HEPA grade air filtration for applications with operating temperatures to 500°F. The Camfil K Series Absolute™ air filter is designed for process applications with operating temperatures of up to 500° F (260° C). The K Series Absolute may be applied in any situation where HEPA efficiency is desired at temperature levels exceeding those found in normal absolute applications.